Diptyque. Best known for decadent candles and synonymous with luxury, the brand actually originated with a trio of artistic souls at its helm, designing fabrics and wallpaper for Liberty and Sanderson. The first Diptyque site opened at 34 boulevard Saint-Germain, becoming a magnet for purveyors of stylish and eclectic articles that couldn’t be found elsewhere. In 1963, the trio began to explore their love of fragrances – first with the candles (that we have come to know and desire), Aubépine, Cannelle and Thé – before the launch of their first perfume. Diptyque has been perfecting the art of candle making for more than fifty years now and it seems fitting to celebrate this milestone with a candle illustrating the central theme of Diptyque’s mantra: design. 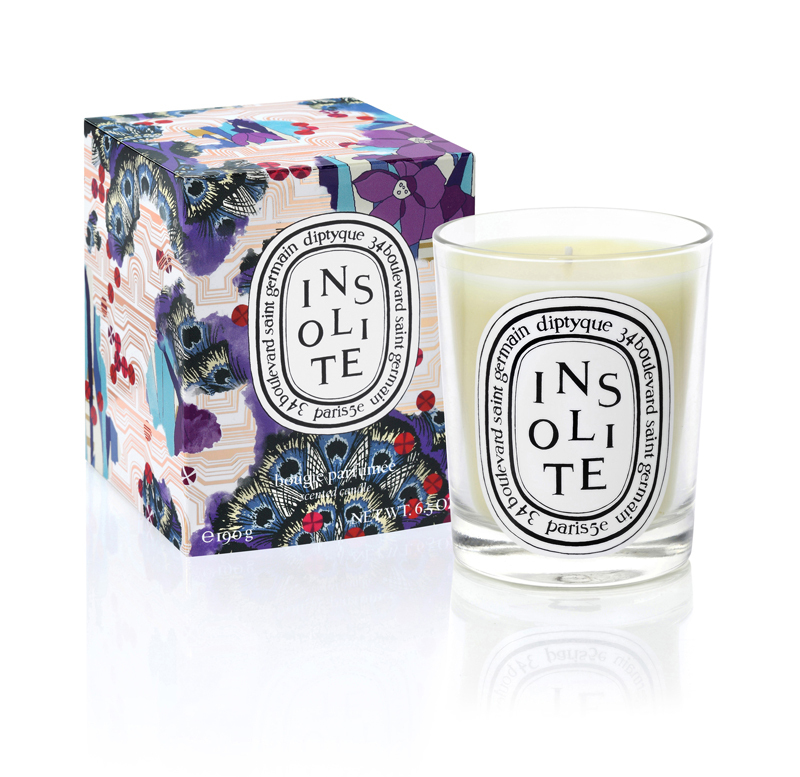 Step forward the gloriously designed “Insolite” candle – a collaboration between Diptyque and Liberty London. Fans of design and print will recognise Liberty’s Needingworth and Peacock pattern intertwined with Diptyque’s original Paladin and Basile motifs. A blend of warm and cold spices including ginger, clove, and thyme, orange and lime zests and peels – Diptyque’s limited edition anniversary candle is to be found only at Liberty. Meanwhile for those unable to get to the Liberty store in time, Diptyque has also created a one-off gift set (equally beautifully packaged) comprising 5 mini candles to represent the best of each decade; including Thé, Jasmin, Baies, Figueri and Ambre. Happy 50 years Diptyque, here’s to 50 more.